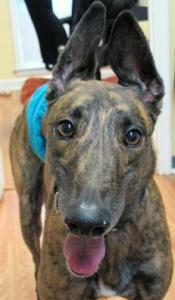 Surfin is a small brindle male that raced at just 64lbs. He has the most beautiful shiny, dark red, brindle coat and cute ears that stand up all the time. He is very cute! He raced at Daytona Beach and then Birmingham AL. Most of his races were in Birmingham. He was pretty good getting up to the top A level of racing and being competitive enough to win at that level. He ran 113 races before quitting in the middle of his last race after being checked by another dog in June of 2014. His sire is Surf Lorian and his dam is JD She Hottie. Surfin turned 3 on August 10th. Surfin can be just a little timid at first in new situations but seems to love people and was happily wagging his tail at the vet clinic as soon as he got there. Surfin is a pretty calm guy but does enjoy running a lap or two in the backyard. He did pass his cat and small dog test so should be fine in a home with either. He seemed to like a 7 year old boy that he met so we think he would be good with kids that age or older. He hasn't been tested with very small kids yet.